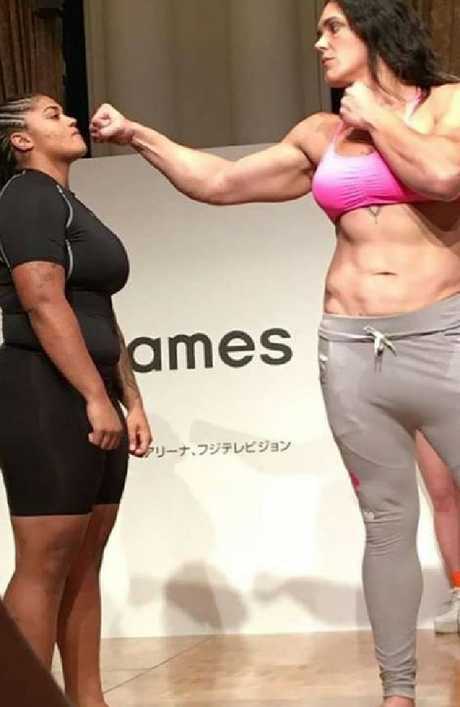 Gabi Garcia weighs in for her latest fight. THAT'S a lot of extra Christmas turkey. Brazilian behemoth Gabi Garcia weighed in a staggering 12kg over the limit for her fight against 53-year-old Japanese pro wrestler-turned-politician Shinobu Kandori, as it went from farce to absolute disgrace. Garcia's date with a middle-aged woman who hasn't fought in mixed martial arts for 17 years was already a freak show. The six-time jiu jitsu world champion is 4-0 in MMA, but all of her bouts in Japan's Rizin promotion have either been egregious mismatches, involved controversy - or both. Garcia and Kandori were scheduled to fight last year but the bout was cancelled when the Liberal Democratic Party member, who won a bronze medal at the 1984 world judo championships, injured a rib. It remains to be seen whether this rescheduled fight will go ahead after Garcia weighed in at 107kg - nowhere near the 95kg limit. Kandori, who hit the scales at 73kg, was visibly incensed by Garcia's lack of professionalism and stormed out of the room. The MMA universe, including Conor McGregor's coach John Kavanagh, was baffled by what is a bad look for the sport. Garcia has hinted the fight may still go ahead, writing on Twitter "I'm still working! After this terrible situation!" and "still don't drink and no eat! Why? Stay tuned". But other reports suggested the bout was off. #RizinFF Update: Gabi Garcia was 12 kgs over. Opponent Shinobu Kandori freaked out and started yelling “this is a disgrace”. Sakikibara came on stage and said “competitionwise, we cannot make this happen.” Stay tuned. Garcia always towers over her opponents. Am I the only one who thinks it's hilarious that that fight even had a weight limit? Like it's totally cool for Gabi Garcia to beat the crap out of a little old lady if she dehydrates herself to 209 pounds the day before, but it's unacceptable if she weighs 237? The least Gabi Garcia could have done for her bout against a granny was not come in 28 lbs over the limit.